We don’t mean to toot our own horn, but we’ve been doing this curtain track thing for a while now, and we’re pretty good at it. 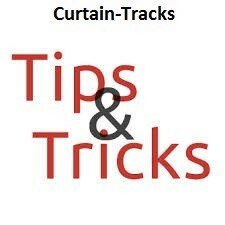 Over the years we have learned many lessons about the best ways to install curtain tracks. Many of our customers are staunch do-it-yourselfers, which we applaud. Allow us to save you some trial and error by sharing some of the most helpful tips and tricks we’ve collected. Almost any curtain track installation project can be accomplished with a drill, miter or hack saw, screw driver, tape measure, and level. If you’ve got these on hand, the next step is to remember some tips that are helpful for any project: ask for help; and measure twice, cut once. Before you cut a track or drill a hole – lay everything out on the floor in front of you. Take note of the relative positions of the curtain track, drapery hardware, and curtain panels. Consider how the curtains will stack, where they will hit the top of the track, the overall length of the curtain panels, and the space between panel and floor. Adjust as needed via hook position or tape height. We don’t care what you use to measure the distance from the ceiling to your wall-mounted bracket – as long as you use the same thing for every bracket. So grab your level, ruler, block of wood, whatever – just use it consistently. Do the same for keeping a consistent distance from the wall and your ceiling-mounted track. Trust us on this one – when using hooks on your curtains, put your carriers or glides onto the curtain track before the track is placed on the ceiling or wall. If you’ve got a snap tape system, snap the carriers onto the curtain and then slide the carriers into the track. When splicing two tracks together, use the factory-cut sides for splicing, rather than the hand cut. We’re sure you’re a fair hand with your miter saw, but the factory cut end is sure to be square and will facilitate a better joint.